My further anonymous user Gnomon suggested a BRILLIANT idea. As everybody knows, the position of the sun indicates the time of the day. 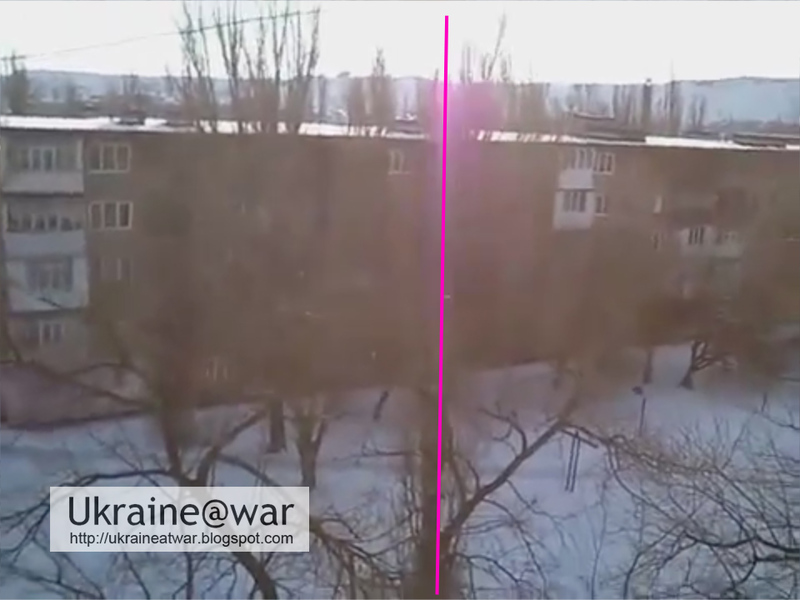 So if we can determine where the sun is, we can check if the Volnovakha GRAD volley was at the same time as the attack! 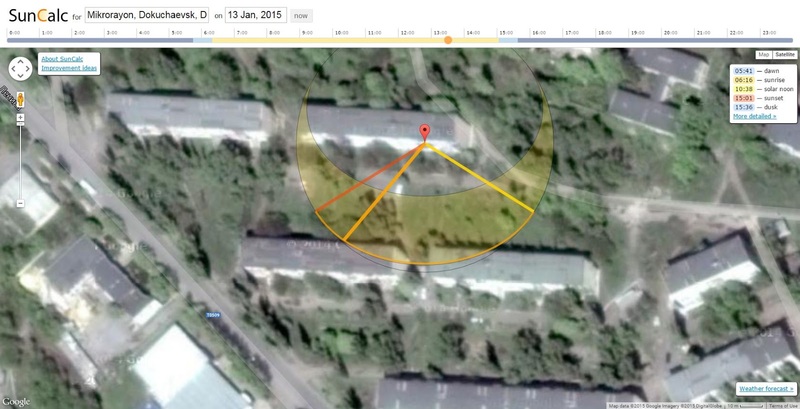 "I want to propose the method of detecting the time of filming for this video. It is possible to do it by analysing the position of the sun. The image is overexposed, but it is still possible to do this by using the lens flare (it appears on many frames in this video). The camera must be placed strictly horizontally. Flare must be strictly on a vertical line that divides the frame on two equal parts. If these conditions are met, than a line drawn from the observer to the middle of the frame placed on the map will show us the direction on the Sun. In this screenshot the horizon is as good as horizontal and the purple line following the direction of the flare almost goes through the middle, so maybe we will be 5 minutes off, but that will be in the margin of error anyways. Now note that the line goes through the third structure from the right on top of the roof . The cameraman is on the balcony (red circle). From there we draw a line through the third structure on the roof (purple line). For now just remember this: the position of the sun and therefore the direction of this line tells us what time it is. I will skip the part what time exactly, since with UTC, GMT and daylight savings it might get very confusing. But we don't need that anyways. The purple line is the shadow of the light pole. I copied that part, so you can see the shadow is indeed there. You will find a cool overlay drawn over the map. 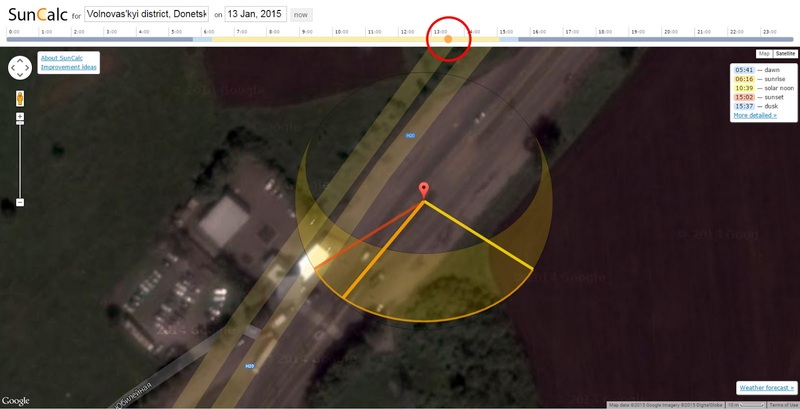 That indicates at what time it will be dusk (dark orange line) and dawn (yellow line). When you change the date this will adjust accordingly. For us right now it is not even that important, but I did set the date on January 13th anyways. What you do is this: put the marker on the top point of the shadow/purple line. And then move the time-slider (red circle) until the orange line goes right through the light pole. Since MY local time does not correspond with the local time in Volnavakha, it does not give me the right time, but we don't need it. The right DIRECTION is enough, because... and this is the clue... it needs to be EXACTLY the same as the direction/time at the cameramans position!!! If not, than it was for sure another volley. If it matches it is ANOTHER indication it was indeed THAT volley. 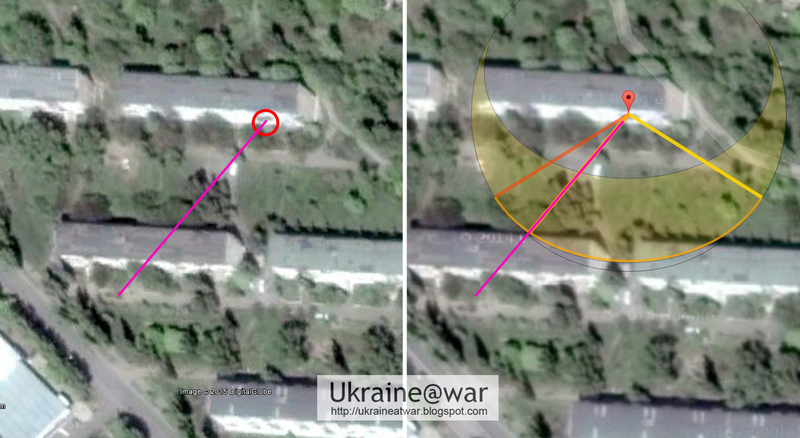 another local indicated that that area is a known firing position. Well satellite images actually, but we will wait for Google to update them. 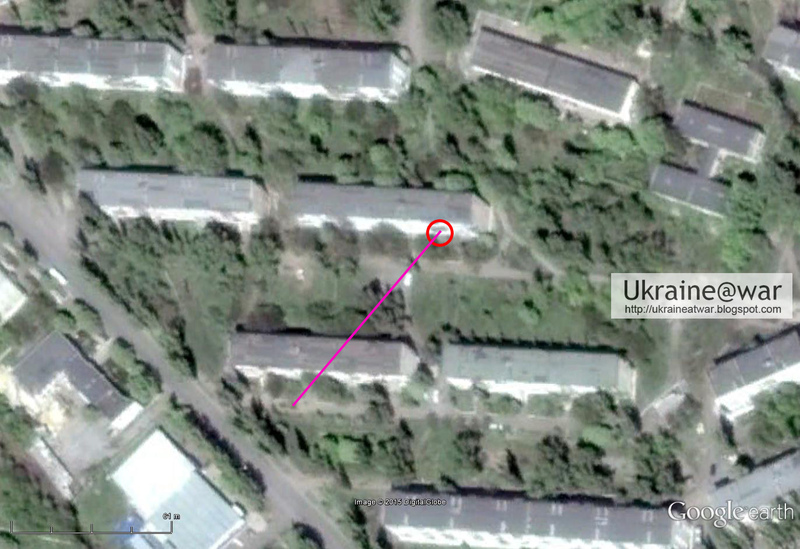 Also see; possible launch location detected for Volnovakha attack. 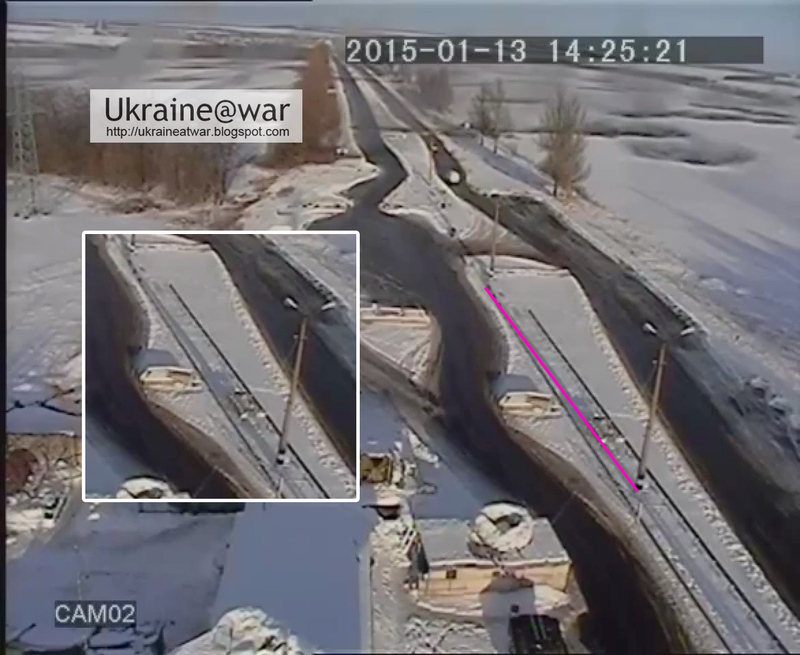 Also see: bus with civilians hit near checkpost Volnovakha.